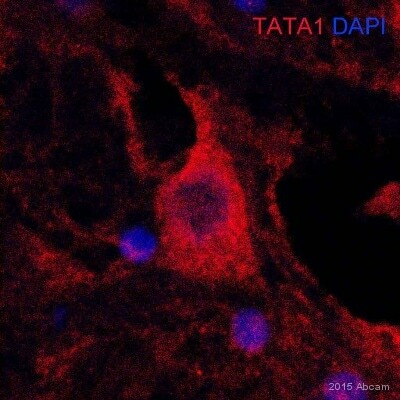 I noticed for your antibody, Anti-TATA binding protein TBP antibody [1TBP18] - Nuclear Loading Control and ChIP Grade (ab818), one of the tested applications is EMSA. I can't find any protocol on your website for how to use this antibody in EMSA. Can you please give me a protocol for this? Thanks in advance for your help! A 25bp oligonucleotide containing a consensus TATA element was purchased from Promega. The reaction volumes were 20ul and contained 8ng of 5’-end-labeled 32P-labeled oligonucleotide and 10ng of human TATA Binding Protein. The reactions were incubated at 23oC for 15 minutes. For the MAb supershift assays, 40ng of MAb was added, and the reactions were allowed to incubate at 23oC for an additional 15 minutes. The reactions were subjected to electrophoresis in a nondenaturing gradient (4-15%) polyacrylamide gel on a PhastSystem for a total of 140-300Vh. 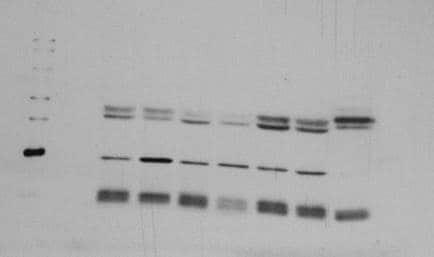 The gel and buffer strips were first soaked in a solution of 1/2x TBE and 2mM MgCl2; the MgCl2 helped to stabilize the TBP/DNA complex in the absence of TFIIB. I received a replacement vial but it is still not wokring as expected. I am sorry to hear the replacement product also didn't work as expected. I would like to offer you a credit as this product is still not working as expected. Please could you confirm whether this is to your satisfaction. I am sorry this product did not perform as stated on the datasheet and for the inconvenience this has caused. As requested, I have issued a free of charge replacement of ab1791 with the order number 1161045. I repeated the experiment and used RIPA buffer for the nuclear fraction but still I have no signal with the anti-TBP ab818! Do you have an other nuclear loading controle AB which I could try? Or any suggestions? Thank you for your updates. I am very sorry to hear that even after following the suggestions, the antibody still does not perform as it is expected. We have alternative antibodies against the same target TBP (ab51841) or against Laminin B1 (ab16048). Please could you take a look at the datasheets of these products and let me how you wish to proceed with your enquiry. We are happy to help customers find the most suitable products for their research purposes . In our review of this problem it does seem that cisplatin may affect the levels of TBP in cells while nucleolin seems affected mainly in it's distribution; however we are not specialized in this particular field and do not want to recommend a product that may be unsuitable. We encourage customers to consult the latest literature available through PubMed and other resources in order to find the most up-to-date information about their specific research interests. Customer increased work load, concentration, incubation time and developing time: no bands! I am sorry this product did not perform as stated on the datasheet and for the inconvenience this has caused. As requested, I have issued a free of charge replacement with the order number 123456.